The bridge end-support substructure abutment and corresponding wingwall length are defined by a bridge site’s characteristics. For most bridge types that are not supported by a retaining wall, such as an MSE wall, the abutment and wingwall enable a designer to transition the top of the bridge elevation to the grade under the bridge opening. To calculate the actual total length of the abutment and wingwall, the designer will need to evaluate the site in 3 dimensions. Determine the pavement elevation at the edge of roadway at the back of wingwall station. For normal roadway segments with the high point (crown) in the center of the pavement, calculate the elevation by taking the crown elevation minus the product of the cross-slope grade times the width from the crown to the edge of pavement. Calculate the top of slope elevation in front of the abutment. This is the soil elevation directly under the bridge beams at the face of the abutment. Typically this value is a minimum of 1’-0” below the abutment seat elevation, however, each state has different standards for this value. Verify the dimension with the engineering standard the design is following. Calculate the back of wingwall elevation. Subtract the value of the wingwall thickness in feet divided by the slope in front of the wingwall grade (ex: 2:1 slope use the value 2) from the top of slope elevation calculated in Step 2. Calculate the skew angle of the bridge in radians by taking the Radian value of 90 minus the angle between the wingwall and the edge of pavement. For wing walls perpendicular to the roadway use a value of 1. Divide the shoulder width in feet by the shoulder grade. For example, use 24 for the shoulder grade value for a 1:24 shoulder slope. This is the amount of elevation drop across the shoulder width. Subtract the shoulder drop value from Step 5 from the edge of pavement elevation calculated in Step 1. Subtract the elevation at the back of the wingwall calculated in Step 3 from the result of Step 6. Multiply the value of Step 7 by the side slope value. For example, a wingwall on a 2:1 slope, multiply the Step 7 value by 2. Divide the result of Step 8 by the SIN value of the result of Step 4. The answer is the wingwall length at one corner of the bridge. Repeat Steps 1 through 9 for each corner of the bridge to determine all 4 wingwall lengths. Calculate the width of the abutment by adding the distance from center to center of all the beams to the distance from the center of the outside beams to the outside edge of the bearings. Add at least a 2" buffer to this total plus the width of an expansion joint, if needed. For the rear abutment, calculate the total length of the abutment and wingwalls from the results of Steps 11 and 12 by adding the abutment length to the two lengths of rear wingwalls. Repeat this procedure for the forward abutment. 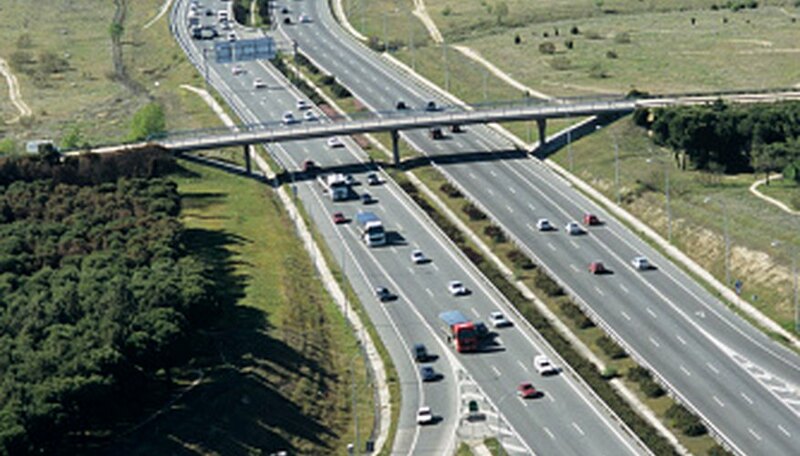 Utilize state highway standards for the design of the bridge. Each state has slightly different standard drawings for bridge abutment designs with wingwall available. These standards are based on American Association of State Highway and Transportation Officials (AASHTO) standards, but also take into account local conditions such as sea water and earthquakes. This procedure is not valid for U-shaped abutments and wing walls. A registered professional engineer is required to review and seal all bridge design plans that affect life or public safety in all the states. Douglas, Allen. "How to Calculate Abutment & Wingwall Length." Sciencing, https://sciencing.com/how-8071705-calculate-abutment-wingwall-length.html. 07 August 2017.